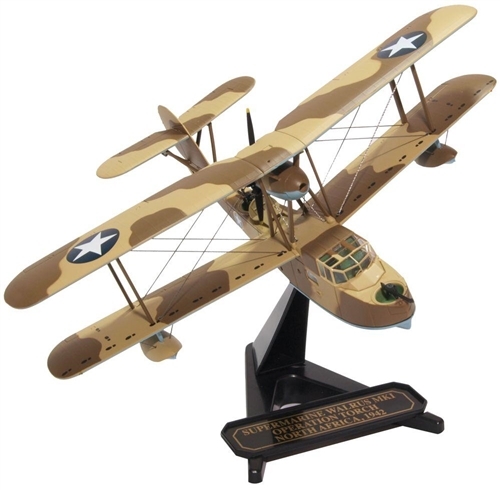 Both high quality and value priced, these detailed reproductions of World War II's most famous Allied and Axis fighters and attack planes feature finely textured surfaces, a well-equipped cockpit with a glazed canopy, authentic markings, and a customized display stand with information on the plane and pilot. The range presently includes 14 different aircraft with 8 more anticipated to launch within the next several weeks. As great as that is, though, here's the really amazing part: when we say 14 different aircraft, we mean 14 different aircraft! That's right: none of the 14 are re-paints, and none of the 8 will be, either. Oxford Diecast is focused on making great aircraft but does not plan to issue second paint schemes for any of its aircraft in the short-term. With Oxford Diecast, every model is unique. One of the nice things about our new site is that it now allows us to highlight some of the more noteworthy items being released by each manufacturer. In the case of Oxford Aviation, what follows is a list of some of the more intriguing products that are scheduled to come out shortly which we feel would be of interest to the savvy collector. The MC.205 Veltro ("Greyhound") is considered the best Italian fighter of World War II. It was said that in the hands of a good pilot, it could defeat any allied plane. When the prototype of the Veltro was built, there were two other planes competing for the same contract: the Fiat G. 55 Centauro and the Reggiane Re 2005 Sagittario. The Supermarine Walrus was a British single engine amphibious biplane reconnaissance aircraft, designed by R.J. Mitchell who was also responsible for the illustrious Spitfire. The aircraft first flew on June 21st, 1933.